Frank Angelino behind the Gilroy Elks bar on a recent Tuesday getting ready for the Gilroy Rotary Club meeting. 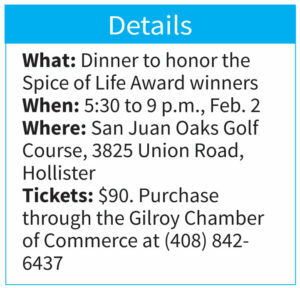 Gilroyans will recognize local community service and citizens’ involvement at the Feb. 2 Spice of Life Awards gala held at San Juan Oaks Golf Course in Hollister. 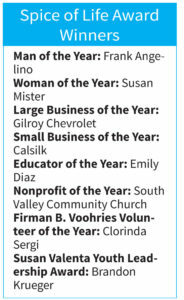 Presented by the Gilroy Chamber of Commerce, the awards honor the businesses, nonprofits and individuals who help make Gilroy a friendly, thriving community. The 2019 Man of the Year is Frank Angelino. Susan Mister is the 2019 Woman of the Year. Despite their extensive involvement with their community, both honorees admitted that they would prefer to shine the spotlight on the organizations they serve. 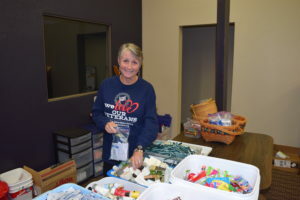 Susan Mister, the 2019 Woman of the Year, packs supplies for service men and women for Operation Interdependence. A look at the many contributions the two award recipients have made to Gilroy over the years proves their generosity in volunteering. Mister has special interests in helping deployed soldiers and honoring fallen veterans. For several years, she has been involved with Wreaths Across America, which places holiday wreaths on vet graves in local cemeteries. The event coincides with the wreath-laying ceremonies at Arlington National Cemetery. Her main service project is Operation Interdependence, which sends supplies to deployed troops. 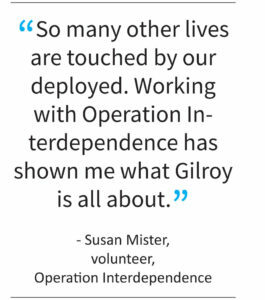 According to the Chamber of Commerce guidelines, the Woman of the Year Award “acknowledges an individual who has contributed to Gilroy’s welfare and betterment.” Mister’s passion for helping deployed service members while teaming up with local volunteers made her a perfect choice. The nonprofit packs C-rations, which are items such as snacks, and toiletries, and ships them to soldiers deployed overseas. The work is done through a team of volunteers. Items are collected with proceeds from a Memorial Day Car Show, a donated site for packing the boxes, and help from Christopher High School students. A handwritten letter is included in every package. This personal touch reflects the spirit of Operation Interdependence. Mister subscribes to a philosophy of helping people who can’t help themselves. 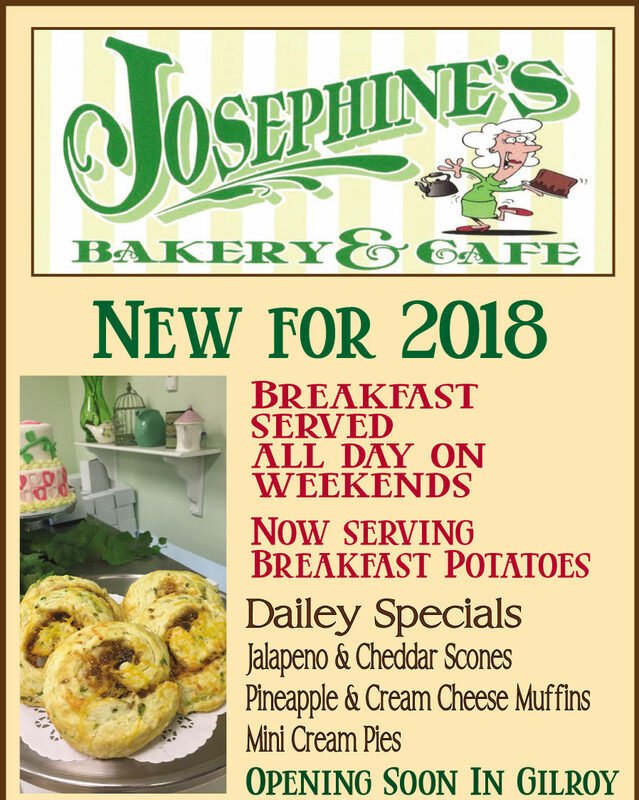 Several times, Mister politely excused herself to greet coffee shop patrons with a hug or a handshake, asking how they’ve been and wishing them well. It’s clear she has many friends. The same can be said for Frank Angelino. “It’s not what you know, but who you know,” Angelino said over a glass of iced tea in the same coffee house. The longtime sales manager/general manager of KBAY-KEZR retired six years ago. 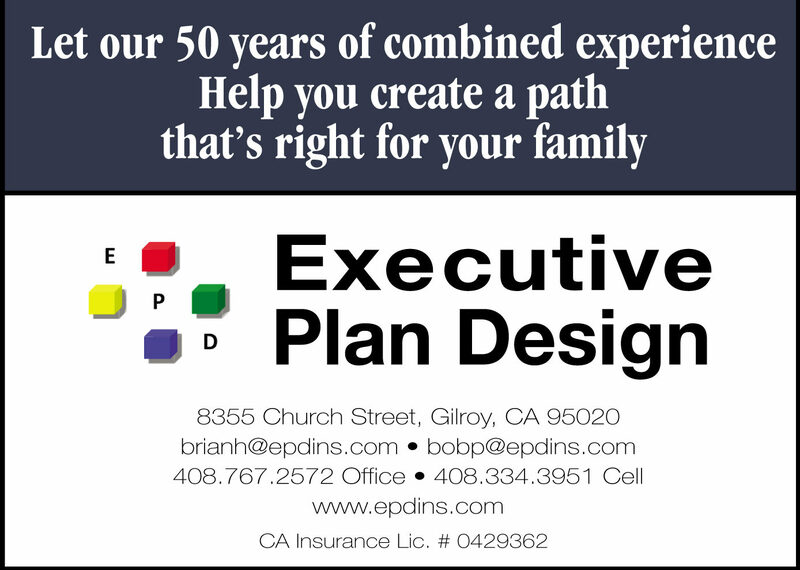 A Gilroy native, he has been active in his community for four decades and has enjoyed serving on many local boards of directors. “I’ve been lucky in the world of fundraising and ‘fun’-raising,” he quipped. That smile has persuaded many to contribute to causes with their time, talent, and treasure. The Man of the Year award acknowledges an individual with a history of unselfish service to the local community. That describes Angelino perfectly. But he’s also relentless about recruiting others to help. Angelino’s community service credentials are staggering. Going back to the original Bonanza Days, he has worked to make Gilroy a better city. Among his many accomplishments, he was on the original board of directors for Saint Louise Regional Hospital and is now the board’s chairman as well as director for the Development Committee. He served on the board of directors for Rebekah Children’s Services. He is the past president and current ambassador of the Gilroy Foundation. 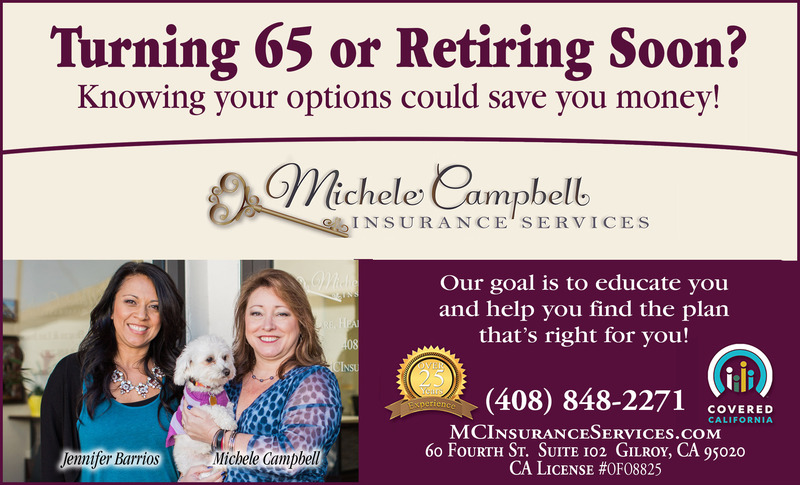 He was on the board and now currently serves as the treasurer on the Gavilan College Educational Foundation. He’s also served in many capacities at the Gilroy Garlic Festival, an event which he refers to as “volunteering at its best.” And through the Spring Lamb Bar-B-Q and bocce ball tournament each year, he works with the Ronald McDonald House to raise funds that defray costs for the families of critically ill children receiving treatment at Stanford Children’s Hospital. This event has raised $100,000 for 10 years straight. It’s no surprise that Gilroy’s 2019 Man of the Year is a stickler for going all in, no matter what he’s championing. 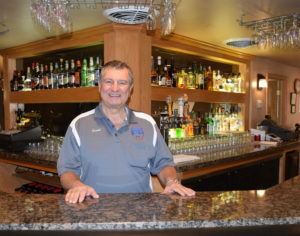 A longtime Gilroy Elk, Angelino says many people know him simply as the “part-time bar guy” at the Lodge. He’s also the club’s public relations director. A special cause in his heart is the annual Gilroy Elks Lodge Casino Camp Night, a “fun”-raiser helping children who can’t afford glasses. “It’s very rewarding to see those kids, and give them glasses, when they can’t afford it,” he said.